Categories in the Retail module and Restaurant module are created in the same way, but used slightly differently in each module. On the restaurant side, categories are basically your menu - for example 'Breakfast', 'Lunch', etc. The categories will become the buttons on the left of the Restaurant module that the waiter will use to select the different options from each category. 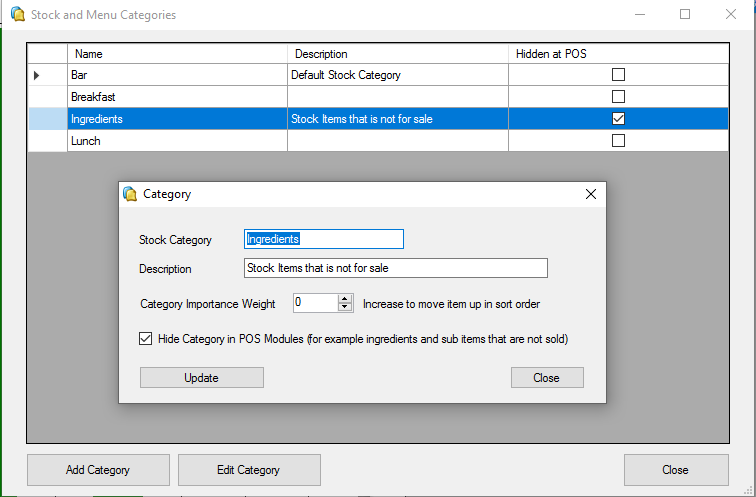 On the retail side, categories are used to group products (stock) into categories for selection and reporting purposes. To add or edit a category, go to ROBOTILL Manager > Setup > 'Product Categories'. The category name is the name that will be used in the POS Modules. The description is optional and only visible in the management program. The importance weight is used to order the categories. For example if you want the categories that are used more to appear first in the restaurant module screen or selection lists in retail, then you can give them a higher weight. For example, you can give the important once a weight of 3, less important ones a weight of 2 and ones that are seldom used a weight of 1 or 0. You can use any number of weight levels. The 'Hide in POS Modules' is used if the products in the category will not be for sale. Examples would be ingredients or sub items used to manufacture other products that are sold.